The sigerTax system allows you to store and track the Depreciation Schedules used by Assessors to determine the value of an asset. These schedules can be "Percent-Good" tables, "Trend" factors, or any combination used to adjust an asset's value. In the sigerTax system, Depreciation Schedules can be found in the Annual Information tab of the Assessor Screen. When you ask a client for information, most of the time you ask for a standard set of information and documents, while other times you may need to adjust that list for a unique property or a specific property type. Sometimes you receive what you need in its entirety, and sometimes you receive only parts of what you need. Keeping track of which information you have requested, and what you have received can become frustrating and difficult if it is not organized in a place where you can always find it. The sigerTax Property Tax system, in addition to the standard tax calculation method that has always been employed in the system, is now able to support fixed rates, fixed taxes, fixed values, capped values, capped rates, and capped taxes. A fixed rate will be the tax rate that will be used to calculate the tax amount. A fixed value is the taxable value that will be used to calculate the tax amount. A fixed tax is the tax amount designated for the parcel. A capped value puts a ceiling on the amount of taxable value. A capped rate likewise puts a ceiling on the rate to be used in the tax calculations. A capped tax is a ceiling on the amount of taxes an account can be charged. Depending on your property tax portfolio, Exemptions and Abatements can be an important part of your valuation process. They can also be confusing, as some jurisdictions give a fixed reduction for a particular exemption category, while others give a percentage off, and some even give a combination of the two. 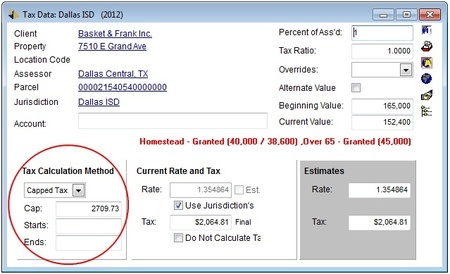 Tracked as “Reductions” in the sigerTax system, these calculations are no longer a hassle. 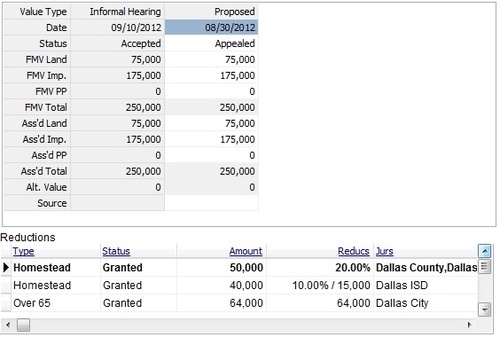 We are excited to announce that sigerTax now supports the automatic calculation of reductions whether the exemption is a percentage of the assessed value or a fixed amount. By including the exemption, or reduction, in the system, you no longer need to manually override the taxable value in order to calculate the correct tax amounts. for a first-hand look at the ins and outs of the website. Please contact sigercon for more information on creating your own Client Website. You don't work for free. In addition to all the other tasks that the sigerTax property tax software makes more efficient, sigerTax can help with invoicing your customers as well. Typically you would create an invoice for a client, add line-items to the invoice, and mail it out. This always leaves the questions "Has everything been invoiced? Did I forget anything?" Through sigerTax, the line items (Invoice Items) are created as individual pieces which are then used to calculate and create invoices. This allows you to view the possible billable items and then decide what to include on your invoices. We also offer an even more powerful tool to be used in the creation of Invoice Items - Invoice Terms. Which Tax Bills are due? When are the Tax Bills due? Rather than searching for these answers client by client, the Tax Bill Log enables you to quickly generate a report of every tax bill within the system matching the designated criteria. This report is available through the System Reports menu, which is accessible at any level of the system. You can use the drop-down options and checkboxes like the ones described below to narrow down the tax bills included on the report. Full descriptions of the report's criteria options are available in the sigerTax Help. We at sigercon are continuously working to improve the sigerTax property tax software system to better meet the needs and requests of our clients. One of our newest additions is the support of international properties in the sigerTax system. When adding data, the system will now include a country field, defaulting to the country selected as the current user's country in the Contact information. For all current users, the default is set to the "U.S.". An address cannot be added without selecting a country for the address. If a different country is selected, the address and phone number layouts will change to match the address layouts of that country. The units of measure on the property and parcel will also change from US Standard to the Metric system, and the currency symbol will become that of the country selected. Currently the system supports the United States and Canada with the ability to add more countries as requested. The new Filtering header (marked here in blue) allows you to narrow down your search results by typing in a column's filter box. The list will automatically filter to match the items in the column that contain the typed text. The data remains filtered even if you click off the list; e.g. go to the Criteria Screen or open a data screen. We here at sigercon are always looking for ways to make your daily tasks within the sigerTax system faster and more efficient. With the latest version, we have targeted the Search List and enhanced it to make your daily searches even easier. These changes include a new filtering header, a way to save your personal arrangement of data columns, a row for totals, columns editable directly from the list, and many other exciting changes, such as improved column management and easier movement within the list itself.